Celebrated Irish singer-songwriter, Luka Bloom, will begin his new album tour in Australia for the first time in March 2005. Luka is keen to share new music with his Australian fans first off this time round, making amends to one of his favourite countries for having to cancel his early 2004 tour due to a stubborn throat condition. It was this very diversion, however, which resulted in a rich and reflective vein of mid year songwriting for Luka, leading to November recording sessions in his very living room, complete with top-notch musicians and recording equipment. The result is one of Luka Bloom's most resonant collections of song, the new album, Innocence, out through Shock Records in February 2005....... Audiences are guaranteed an uplifting and different night of music from Luka Bloom on his Innocence tour. Luka's focus has shifted. He still electrifies all in his company, but the rock inspired performer has given way to the man who puts the song, the words, the meaning and the heart first. Where it deserves to be. Luka Bloom kicks off new album tour in Australia for Adrian Bohm Presents, with a stopover at the East Coast Blues & Roots Music Festival. Bloom is apparently keen to share new music with his Australian fans first off this time round, making amends to one of his favourite countries for having to cancel his early 2004 tour due to a stubborn throat condition. He says: "I really love coming to Australia, and I certainly owe you one, so I'm coming straight over to start the album tour this time. I think there's a deep empathy between Australians and the Irish, something hard to define but probably evident within our similar, self-effacing sense of humour. I do always feel at home in Australia. "With the Innocence album, I feel really happy with the songs, and love singing them. It's quite a different studio record for me. Rather than emphasizing, say, the guitar sound, the songs and words are very much the focus which captures where I'm at and my feeling towards songwriting these days." Readings Hawthorn, 701 Glenferrie Rd Hawthorn. A regular visitor to Australia, Luka Bloom is a contemporary Irish singer-songwriter whose live performances have helped him create a large and loyal audience. Here to promote his new album Innocence, this is a rare chance to see, meet and hear a star of the folk scene up close. Luka will perform songs from Innocence, an album that builds on his previous offerings to deliver a work that no longer relies on just vocals and guitar, but demonstrates his maturing talents as a singer and songwriter. An uplifting experience for the soul. Well-loved Irish folkie makes his annual pilgrimage to Oz. 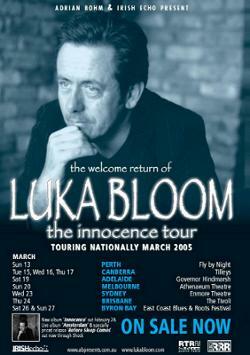 Luka Bloom has released scores of his own albums, but in Australia he is best loved for his live performances. Indeed, the Irish singer-songwriter is so popular is here that he can tour annually at large-scale venues, despite the fact he no longer has the backing of an international record company. The story starts in County Kildare, 1955, when one Barry Moore is born into a family of musicians (including brother Christy Moore). A well-loved folk singer until tendonitis made him abandon the finger-picking style, Barry played with a post-punk band (Red Square) and as a solo artist in countless Irish pubs before moving to New York in 1987. On the plane trip over, he christened himself Luka Bloom (Luka refers to the Suzanne Vega song of the same name, and Bloom to James Joyce's Ulyssess), and thus began a new phase in his career. Residencies at New York venues like Dylans and The Red Lion saw Luka hone his craft. Although folk remains his musical touchstone, Luka has proven to be a talented interpreter of other genres: a memorable cover of LL Cool J's I Need Love appeared on his 1992 album The Acoustic Motorbike. Expect Luka's trademark astute lyrics and soulful vocals as he returns yet again. Celebrated Irish singer-songwriter, Luka Bloom, will begin his new album tour in Australia for the first time in March 2005 for Adrian Bohm Presents with a national string of dates including here in Melbourne. Luka is keen to share new music with his Australian fans first off this time round, making amends to one of his favourite countries for having to cancel his early 2004 tour due to a stubborn throat condition. It was this very diversion, however, which resulted in a rich and reflective vein of mid year songwriting for Luka, leading to November recording sessions in his very living room, complete with top-notch musicians and recording equipment. The result is one of Luka Bloom's most resonant collections of song is his new album, Innocence. Luka Bloom with Monique Brumby. Seated tickets $55 plus booking fee (limited, available at Ticketmaster 7 or phonebook). Standing tickets $45 plus booking fee. Tickets on sale now from Ticketmaster 7, Prince Public Bar (standing only), phonebook on 03 9536 1168 or book online here. Doors open 7pm. - Luka Bloom on stage at 8.45pm. Luka Bloom's show at the Athenaeum Theatre this Sunday March 20 has been seeling so well that he will perform a second show in Melbourne, at the Prince Of Wales this coming Monday March 21. Luka Bloom: The intense Irishman brings his acoustic guitar and all those rich folk tunes to Brisbane, with support from Monique Brumby. Thursday (Mar 24), The Tivoli, ph: 3852 1711. Perennial tour from doe-eyed Irish troubadour comes between Sleep and Innocence. Irish romantic Luka Bloom has had a snoozy time since his last visit here in 2003. A recurring tendonitis problem led him to make a softly strummed Spanish guitar album called Before Sleep Comes. Its success, he says, "blew my mind", and another album, Innocence, is already in the can. "My only disappointment", he reckons, "was not getting to Australia." ..... He'd started out as Barry Moore, but borrowed a new name from Suzanne Vega and James Joyce to distance himself from the shadow of his celebrated big brother Christy, of Planxty fame. As fate (and nepotism) would have it, Bloom guested on that legendary folk-rock band's reunion dates in December of last year. As always, though, he returns to Australia armed only with his booming 12-string guitar, a voice of pure silk and a winning way with the ladies. Luka says: "I really love coming to Australia, and I certainly owe you one, so I'm coming straight over to start the album tour this time. I think there's a deep empathy between Australians and the Irish, something hard to define but probably evident within our similar, self-effacing sense of humour. I do always feel at home in Australia. With the Innocence album, I feel really happy with the songs, and love singing them. It's quite a different studio record for me. Rather than emphasizing, say, the guitar sound, the songs and words are very much the focus which captures where I'm at and my feeling towards songwriting these days." With a critically acclaimed back catalog of songwriting, Luka Bloom is an inspired and inspiring live performer. His concert arsenal includes both tender and dynamic original material and a surprisingly eclectic selection of other people's material; songs loved by Luka........ Audiences are guaranteed an uplifting and different night of music from Luka Bloom on his Innocence tour. He still electrifies all in his company, but the rock inspired performer has given way to the man who puts the song, the words, the meaning and the heart first. Where it deserves to be. 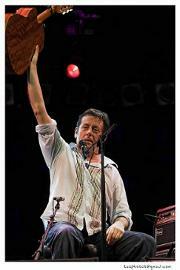 A big hit with Australian audiences over the years, Luka Bloom is set to light up hearts in Byron Bay in 2005. With a critically acclaimed back catalogue of songwriting, Luka Bloom is an inspired and inspiring live performer. His concert arsenal includes both tender and dynamic original material and a surprisingly eclectic selection of other people's material; songs loved by Luka. As one Australian reviewer said: "Luka is a solo performer whose trademark is his thunderous and exhilarating acoustic guitar playing, his fine voice and his warm and passionate delivery." Bo Diddley, Janis Ian, Luka Bloom and George Thorogood will lead the international contingent at the 2005 East Coast Blues and Roots Music Festival. Locals to perform at the annual festival include Kasey Chambers, The Whitlams and The Cat Empire. The East Coast Blues and Roots Music Festival, which is in its 16th year, runs over the Easter long weekend from March 24 to 28 at Byron Bay's Red Devil Park. Toby will be supporting international artist Luka Bloom on Sunday 13th March at the Fly By Night Club, Fremantle. Don't miss out on your tickets! SUN 13.03 - fly by night club, fremantle - support for LUKA BLOOM - SOLD OUT! Announcing... Heather supports LUKA BLOOM! Heather Frahn is one of Australia's finest young voices on the contemporary folk/roots music scene. Heather's name is on the rise with tours in March and April, including a performance in Melbourne's internationally known Brunswick Music Festival, and support for folk music legend Luka Bloom. Monique will also be playing shows in Melbourne, Sydney and Brisbane with Irish troubadour Luka Bloom in March, so book in early to avoid disappointment! In our arts section this week we chat with Luka Bloom, the Irish folk singer making the most of his 'second life'. The good folk of Newbridge, County Kildare, Ireland, were holding a singing competition in the local cinema. It was a bone-cold night, December 1960, and five-year-old Barry Moore was shaking in his duffle coat when he claimed his prize for a stirring rendition of Irish ditty 'My Singing Bird'. "I won a Christmas pudding," says singer Luka Bloom, recalling the first really big moment in his first life - the life before Barry Moore changed his name, beat the booze and escaped to America. "It was the first time I'd sung in public. And that was the first time I realised that you got rewarded for doing this. I'ver never really stopped ever since." "I'm in Ireland, and it's not too shabby now I must say," enthuses Luka Bloom down the line in his engaging brogue. "Spring is here, the daffodils are up, the birds are singing." How can he even contemplate leaving this bucolic idyll? "Ah, I'd only leave to come to Australia, that's the only reason I'd leave," he chuckles. With his 10th album Innocence in the can, Irish singer songwriter Luka Bloom plays The Fly By Night Club on Sunday, March 13. The well-travelled and articulate songsmith has decided to commence his world tour in Australia to make amends for having to cancel his 2004 tour, due to a persistent throat condition. Luka Bloom spoke to Chris Havercroft about touring, his new release and rap music. One of the side benefits of the East Coast Blues and Roots Festival is that it enables a significant group of artists to undertake tours here. While most of the festival has long since sold out, side shows spread the musical magic outside the Byron Bay region. In the coming days, southeast Queensland is to be blessed with comparatively rare shows by Irish singer/songwriter Luka Bloom, London-based acoustic blues aficionado Eric Bibb and fast-rising Irish group The Frames. Bloom is rightly proud of his latest album, his 10th, titled Innocence - so much so that he's devoting the next couple of years to supporting it. "It's the first album that I've released in a while that I really want to get out there and sing the songs and give it a good old lash," he chuckles down the phone line from his new rural home-base outside Dublin. "What's interesting about this album is that I recorded it here in my living room. I brought in some really great musicians and some really good equipment on loan from the Windmill Lane Studios. It worked out really well but maybe it's just because of this group of songs. There's something very intimate and personal about the record that I'm hoping Australians will really like. It's not always easy to take people with you but you gotta do what you gotta do. The worst thing is for people to walk into a show being performed by an artist like me and finding that the act is on auto pilot and singing by numbers. The punters need to know that an artist is still fired up; still changing; still trying to make the show more interesting." Luka Bloom plays The Tivoli in Fortitude Valley on Thursday...... and is appearing at the East Coast Blues and Roots Music Festival. Richard Stubbs talks to celebrated Irish singer-songwriter LUKA BLOOM about his new album Innocence, and he'll play live. He's never been on the MTV awards, he's never dated Paris Hilton, but he's one of Ireland's more successful musical exports. He's done it with a combination of gentle melody and carefully crafted lyrics. Word of mouth, coupled with the acclaim of music writers, and ABC airplay has kept bringing Luka Bloom back to Australia to play for enthusiastic audiences. Mr Bloom breaks what he does into three compartments - writing a song , recording a song, and performing it. "The performance is the celebration part of the other two jobs" says Luka Bloom. Russell Woolf is interested in Luka's recent live album 'Amsterdam'. It was unusual as a live recording from a single concert (most live albums are edited together from several concerts). It turns out that it was extremely unusual because Luka's not a fan of live albums at all. "I don't listen to live albums mostly", he says, "unless it's jazz". He was only recording with a view to a 'B' side, but then said "God I've really got to release this". As the title indicates, 'Amsterdam' was recorded in Holland. The crowd sang along in particularly moving fashion. Luka reckons that, perhaps unexpectedly, "the Dutch and the Belgians are just gorgeous singers". Luka Bloom is only just now resuming live performance. For parts of last year he could neither play nor sing. He was struggling with tendonitis because "I'd basically been playing for thirty years and not really stopped to pay attention to the way I was doing what I was doing". He'd no sooner overcome the tendonitis and he got voice nodules. This led Luka Bloom to have to reinvent himself as a performer. And yes he's happy with the result. As heard on 720 Drive. He has a brand new album called Innocence and appears at the Fly By Night Club Fremantle on the 13th March. Breakfast guests not to be missed! Join Angela Catterns for Breakfast on Tuesday 15 March when the enigmatic Irish folk singer/songwriter Luka Bloom talks about his new album Innocence. Tracks featured were Primavera, In Between Days, Salvador, Blackberry Time, No Matter Where You Go There You Are, The City of Chicago (Christy Moore version), Peace On Earth. Irish musician Luka Bloom began life with a much duller name. He was born Barry Moore, but decided on a plane flight to New York to adopt the new moniker. It was 1987. Barry was off to a new country, with new people, so why not a new name too? Luka comes from the Suzanne Vega song My name is Luka and Bloom is from James Joyce's Ulysses. Luka grew up in County Kildare in Ireland and was educated by the Patrician Brothers and the Dominican Fathers. He is the brother of folk musician Christy Moore - or as Luka likes to say in concert - Christy Bloom is his brother! Music was an intrinsic part of his life growing up. The Moore family all sing and play, but Luka had his own way of making music. His first tour was as the support act to Christy Moore in 1969. Luka Bloom was 14 years of age. Severe tendonitis damaged his guitar picking hand, but it was a blessing really; it made Luka learn to play with a plectrum. He also adopted some silly antics on stage. In 1991 Luka recorded the album Acoustic Motorbike and at the PinkPop Festival in the Netherlands, cycled on stage with the guitar strapped to his back. He travels to Australia often. "I think there's a deep empathy between Australians and the Irish, something hard to define but probably evident within our similar, self-effacing sense of humour," Luka says. "I do always feel at home in Australia." His shows include tender original material, but his cover songs are equally superb. Luka Bloom hit the big time in America with a stripped-back Irish version of the rap song 'I Need Love' which was first done by LL Cool J. Luka says he does not include cover songs in his set just for the novelty factor. "I have always believed that it is possible for a solo artist to sing songs from any area and the only limitations are in people's minds. Rather than covering these songs as a novelty, I was determined to convey my love of these songs and the artists who created them." The album Keeper Of The Flame saw him tackle songs from Bob Dylan, The Cure, U2, and even the Hunters and Collectors ballad 'Throw Your Arms Around Me'. The new album Innocence is a departure from the norm. It is more about the lyrics than the sound. Luka paints pictures through his poetry and lets the music simply add to the mood. is comprised of the most played albums from past week. Ok. I'm going to try and be objective. But oh. Luka, Luka, Luka. Warm, endearing, unashamedly romantic Luka. Once again he entranced and beguiled a fully receptive Tilley's crowd. It must be said that at this gig of gigs, even the most cynical of cynics would have melted into a gooey mess on the floor. Promoting his new album 'Innocence', the audience was captivated with every touching, funny, earthy song and every cheeky, self-deprecating word Luka said in between. Both new and old music was as usual hearty. Personal, often revealing stories and earthy heart-felt narratives. Beautiful musings about love, renewed friendship, life experiences, random meetings, random incidents and world events. Songs to his girlfriend and songs written for his brother, Christy Moore, were amongst the rawly honest mix. With an enduring musical catalogue behind him, he impressed all with his sincerely expressed songs. Together with his witty, loveable Luka-isms and his simply performed music, he charmed all present. No doubt, the audience there in the warmth of Tilley's, would heartily agree that seeing Luka Bloom perform live is always, without fail, an unforgettable experience. Music concerts usually fall into two categories. You are either shifting uncomfortably in your seat all night, or you are motionless, drawn in by a performance you hope will never end. Fortunately, Luka Bloom's show at the grand Tivoli theatre was the latter. Luka's magic lies not in his ability to pen a good tune (although he does that!). It lies more in his ability to tell stories. His shows are simple yet effective; one man, one guitar, endless stories. He takes delight in sharing intimate moments with his captivated audience and loves to take you on a journey with him. The highlights of last Thursday's show came thick and fast; the harsh brown Australian landscapes as described in Diamond Mountain, the sparse and beautiful treatment of the Bob Dylan-penned To Make You Feel My Love, the story of an Algerian migrant to Galway in the moving No Matter Where You Go, There You Are. And then there was Luka's own protest song I am not at war with anyone, a stirring song aimed squarely at Mr Howard, Mr Bush and Mr Blair, and made available on his website. The audience was not left out either and the crowd joined in unison for the sweet tribute to Luka's son Sunny Sailor Boy and the Hunters and Collectors song Throw Your Arms Around Me which closed the encore. He showcased a plethora of songs from his new album INNOCENCE but delighted with the inclusion of The Cure's In Between Days too. Mr Bloom can draw you in with his Irish brogue and his simple lyrics and take you on a journey. That is the magic of his music and his shows. On the Crossroads Stage some distinguished solo performers found themselves battling irritating sound spillage from bands playing on adjacent stages. It is to be hoped that this long-standing problem will be eradicated when the festival moves to a bigger site at Tyagarah, 10km north of Byron, reportedly in 2007. At one stage, the excellent Canadian blues/folk multi-instrumentalist Michael Jerome Browne was all but drowned out by a booming bass drum. The audience came to the rescue with some well-timed handclapping ("You guys are hired," said Browne expressing his gratitude). The veteran American singer-songwriter Janis Ian found herself competing with an incredibly loud instrument (played by one That 1 Guy's on the new APRA Stage), yet still managed to make a big impact with her intelligent ballads and equally insightful between-songs discourse. Irishman Luka Bloom's forceful rhythm guitar playing helped him alleviate the problem. The soloists on the Jambalaya Stage, those keepers of the blues flame par excellence, Guy Davis and Eric Bibb, also suffered to some extent from the audio encroachment from elsewhere. ...I'm sure they'll both be back at Bluesfest. I guess I will too! Maybe it's true that every Irish man and woman within travelling distance of Sydney (including Luka Bloom) was in the room and responding with the kind of fervour which can come when home is an age away but alcohol is very near and not at all dear........ This wasn't mere energy but belief being sent back and forth. Belief in what? In the power of a song and a lyric to say something to and for you...... They're ready, maybe too ready, to let loose at the first sign from the stage. Keep in mind, too, that Glen Hansard's songs aren't fun, frivolous things. They're often racked with guilt and uncertainty, resolution always seems tantalisingly close but never quite reached, and they're laced with Seamus Heaney and Leonard Cohen. Or at least their spirit. You can look at a song such as Keepsake, for example, and say, yes, it's nervy internalising which then breaks out into a U2-like grandeur. You can hear What Happens when the Heart Just Stops and say beautifully sad intensity, or the Luka Bloom-assisted foray into Can't Help Falling in Love with You and say romantic crowd pleaser. And you can analyse Revelate and say it's brilliantly both religious and guttural..... Whatever it is, a Frames show has it in spades. Gloriously so.